PHOTO INTENSE…..fair warning…… (this is a multi-part post)…. I’m back from a week of travel with my sister. Travel can be fun, but not always! Some parts of it are just a pain in the neck!! It was a GOOD week to be away from Delaware where the temperatures were in the single digits during the night and a flurry of snow turned into 3 inches! The Saturday morning I departed from home “in the dark” and was at the airport only a few minutes when the morning light caught my eye. 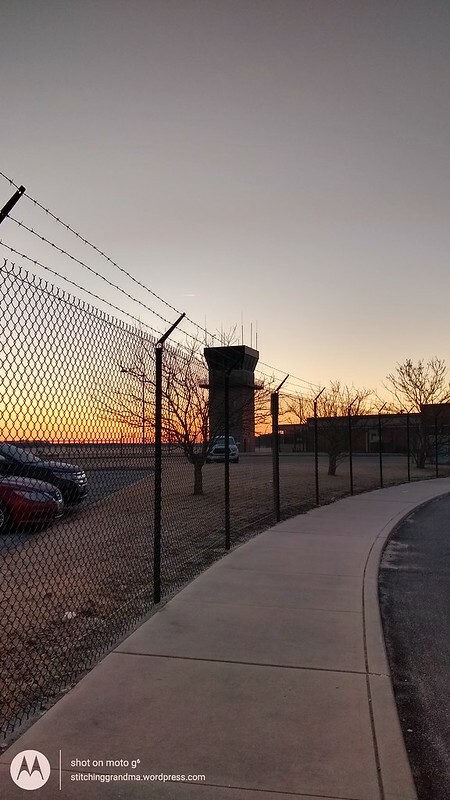 Those quiet dawn moments on the flightline are one of the few things I miss about going to work. Then I remember it was the ONLY good thing about working the midnight shift, and that dawn’s early light meant the shift was going to be over soon. Hubby always teases me about getting to the airport so early. I had an 8:30 am flight, which according to TSA rules meant a 6:30 arrival. 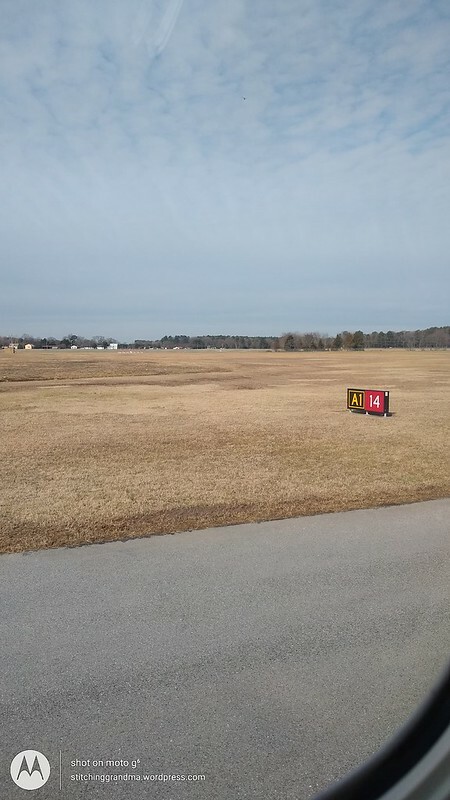 Well, I guess I can tell you that our little airport knows how to handle the big crowds! I got comfortable and put my feet up watching the folks check in ! Then of course, once TSA opened the security line for the flight, I breezed right through….only to find myself at odds, waiting on a 4 hour delay. Seems the flight crew didn’t want to fly, and we had to wait on ANOTHER crew to arrive from Charlotte to take our aircraft out. I kept myself entertained while I waited patiently. 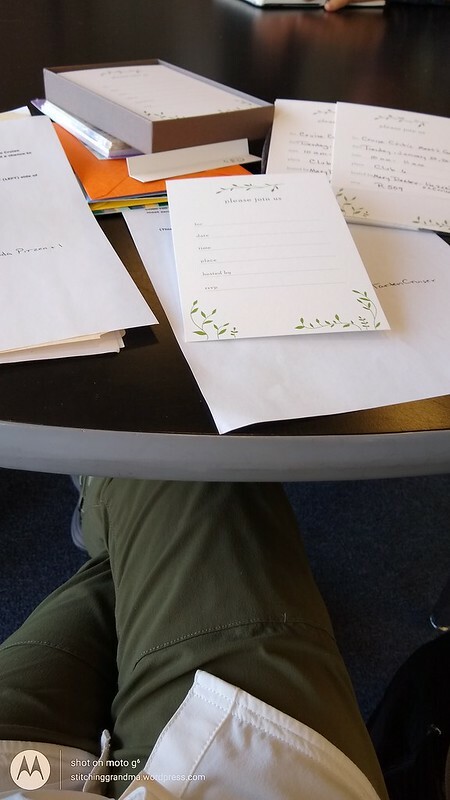 I wrote out 16 invitations to the upcoming Cruise Critic Meet & Greet for the officers onboard the Regal Princess. 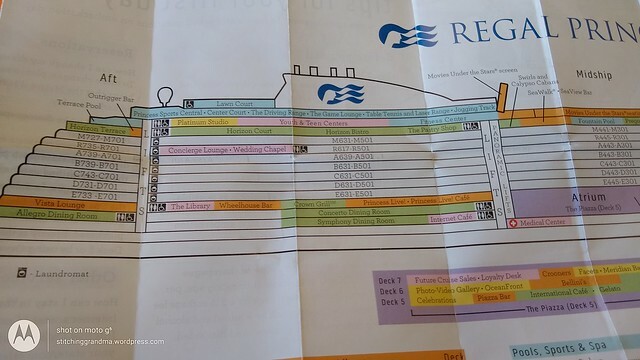 Then, I studied the ship map….again….just to make sure I knew where everything was once I boarded the following day. Finally at 12:05 we were out on the runway, ready to depart!! What a way to start a vacation~! 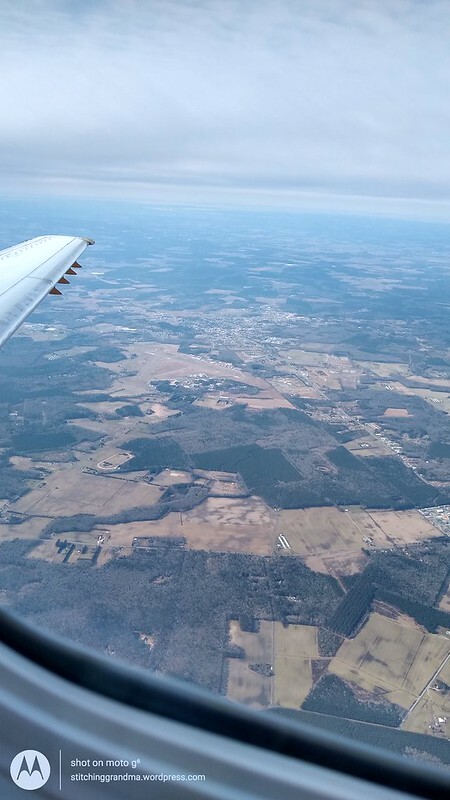 !~ It was a lovely day for flying and taking photos from the airplane window. 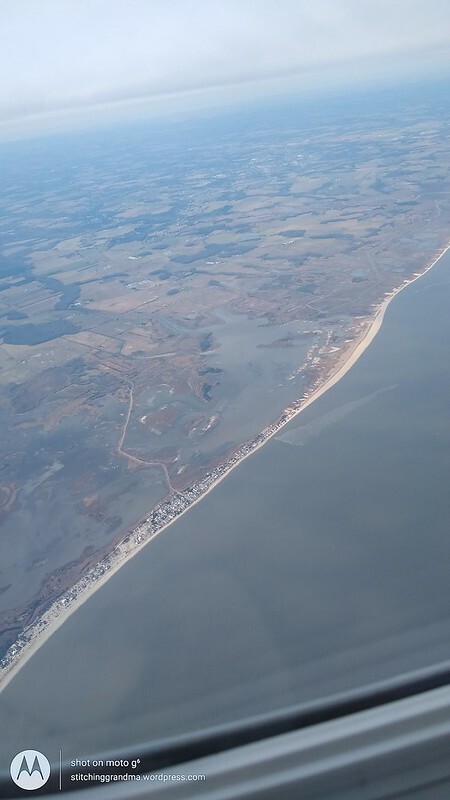 Our 29 minute flight from Salisbury Maryland (SBY) to Philadelphia PA (PHL) takes you along coastal Delaware before crossing the Delaware Bay and flying over New Jersey as you approach the Philadelphia Airport. 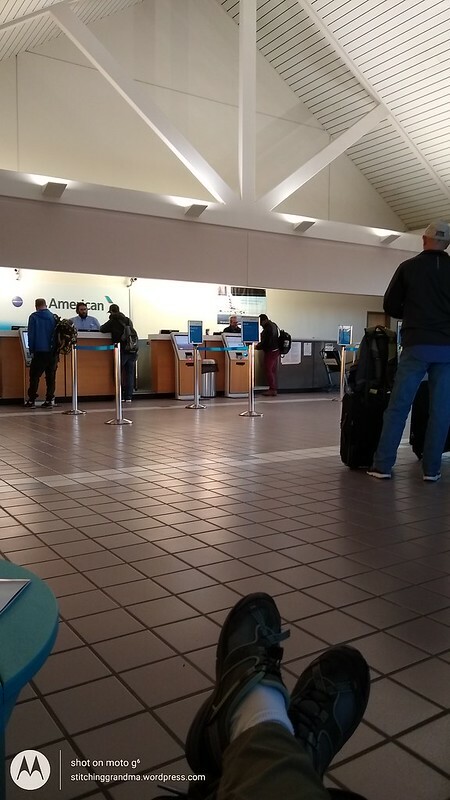 Anyway, when I finally arrive in Philadelphia, my “new connection” required another wait once I arrived. So, I stopped for lunch and a well deserved adult beverage! 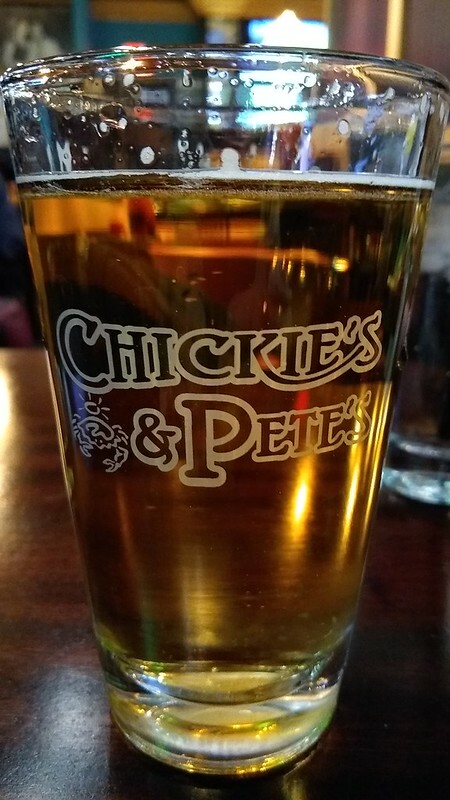 I enjoyed an Angry Orchard cider with my “Philly Cheese Steak Sandwich” while I relaxed and waited 2 hours for the “new connection”. 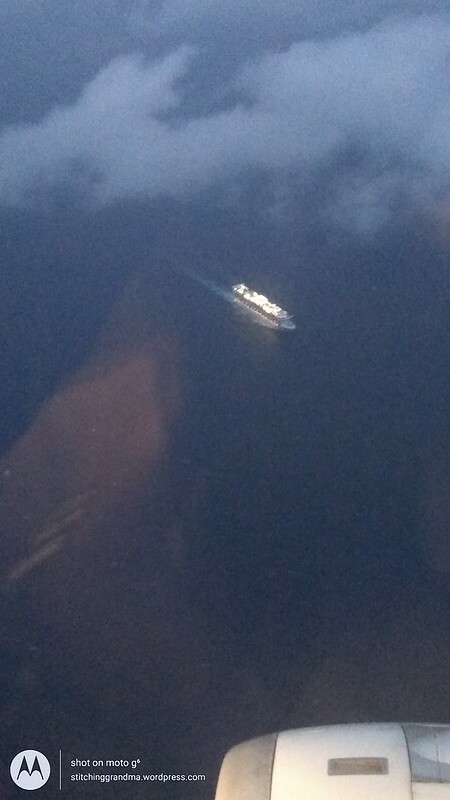 I had a view of a cruise ship leaving Port Everglades as our flight approached Ft Lauderdale! This day of travel was a good reminder of why I always, always, always, fly in the DAY before the ship sails. I am glad that was not the Regal Princess ! That would not have been a good finish to the day. I finally arrive in Fort Lauderdale, much later than I had originally planned. Rain greeted me while I waited for the shuttle to the airport hotel. My sister had arrived from Nevada a few hours earlier, had the room, and had dinner ordered from a local place that delivered. I dropped my luggage in the room, opened the suitcase to “dry out”, and relaxed for the evening. Note – I always always always pack my clothing in Space Bags (available on line or in your local big box stores). This is NOT the first time my suitcases has gotten wet in transit! It was easy to take out the space bags, wipe them with a towel and let the suitcase air dry in the hotel, then reload them in the morning. The suitcase dried easily overnight in the hotel room, set near the air conditioning vents. If it had not been dry, I would have used the hotel hair dryer! 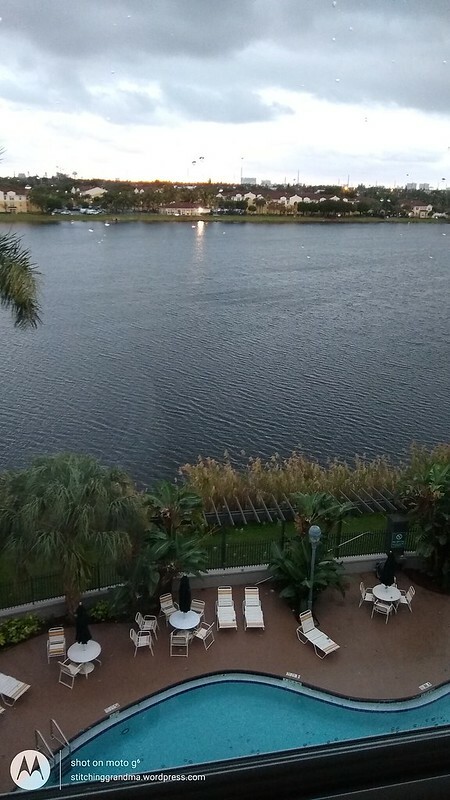 The morning view from the hotel room window was nice, but there was a bit of drizzle to start the day. I used the hotel shuttle to make a quick trip to K-Mart near the hotel and picked up a few necessities (2 bottles of wine for the ship). It was too drizzly to make the walk to the store and I wanted to make sure I had the essentials for the cruise. Later in the morning the sky cleared up nicely and I was able to take a nice walk before it was time to board the shuttle to the ship. 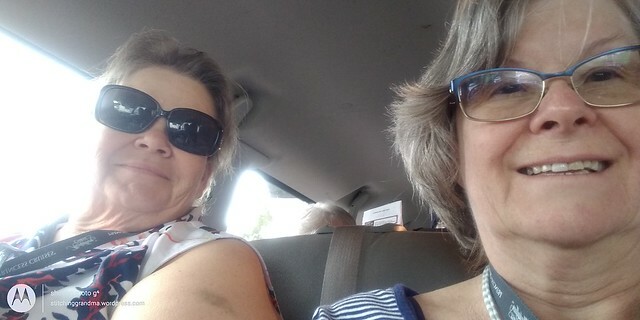 My sister and I planned for one of the latest shuttles (Noon), to avoid some of the crowds at the hotel and at Port Everglades. Our hotel uses a service for that transportation which was quite efficient. We were READY to go. Streamlined boarding was wonderful. A good tip to the porters at the port got our luggage taken care of quickly, and having our Cruise Medallions already made it the fastest check in ever. No waiting. We walked up with our boarding pass, our Medallion, were given our cruise cards, and we were on the ship within minutes of arriving at the port. 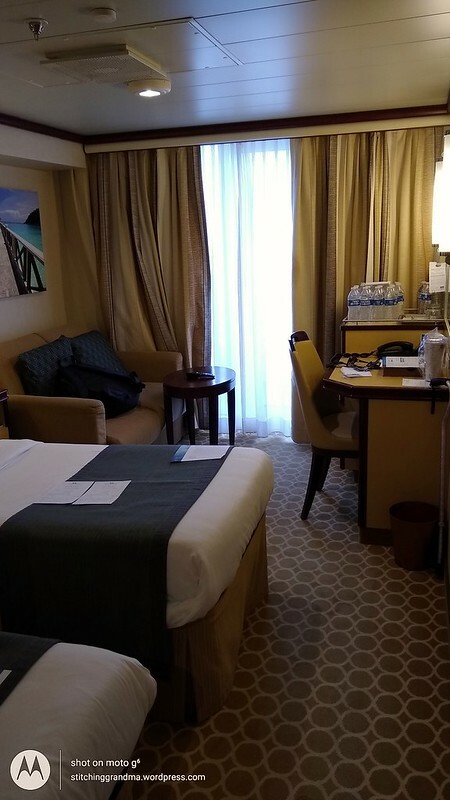 It took no time at all to settle into our “Deluxe Balcony Cabin # R509 ” on the Regal Princess. A big improvement from the original inside cabin we had booked, and the upgrade was well appreciated. This cabin had a love seat and a significantly smaller bathroom than our mini-suite on the Regal in December. But the extra space was nice in the cabin and we enjoyed having the balcony. Our pre-ordered water, and my cup for the “soda” package was already in the room. 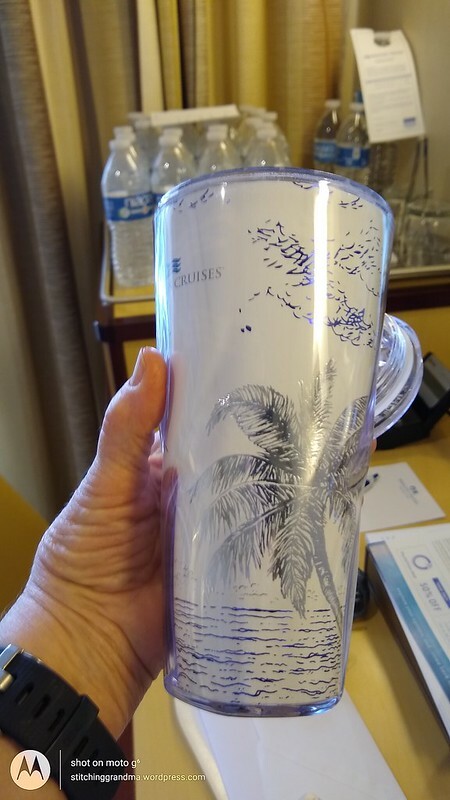 (In December when Hubby & I cruised on the same ship, they had a shortage of the cups for the “soda” package, and compensated us with multiple large bottles of water in lieu of the cups. We never use the cups on the ship, we just bring them home, so it was not a big loss). I do like the new design! Much heavier tumbler than “last spring”. I just had to add the wine to the fridge. A call later in the afternoon for room service to deliver the “liquor & beer” and we were ready to sail! We made plans to attend the Platinum and Elite pre-dinner cocktail party every night. 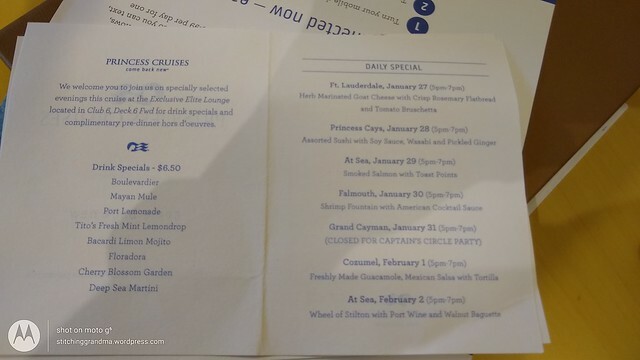 I liked the new drinks being offered daily. These were “specially priced” for the cocktail party and we were tempted with many of them. As we wandered around the ship, we enjoyed looking at all the other ships and the activities as they all prepared to depart. 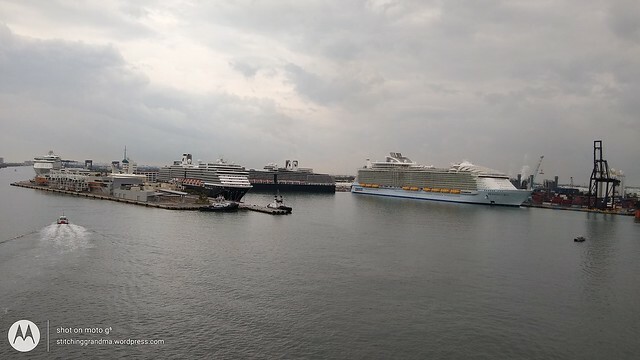 As we sailed out of the channel, the Regal Princess played the LOVE BOAT theme with the ships horns. I’m sure the residents hate it, but I loved it!! Our itinerary was to take us to Princess Cays, Bahamas, a tender port for Monday. The dawn was beautiful. Sadly, there was just too much wind and choppy seas for us to safely tender and the Captain chose to skip the port. Later in the day we had to endure the rain that accompanied that wind, and it made for a soggy sea day. The crew was quick to arrange new “onboard activities” in the Piazza, the center of the ship; and in other public spaces. 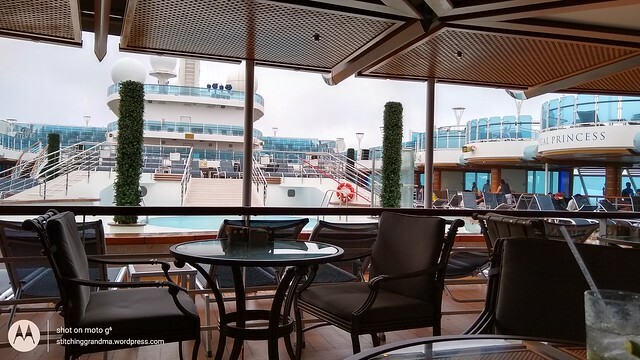 I enjoyed my time “under cover” on the Lido Deck. 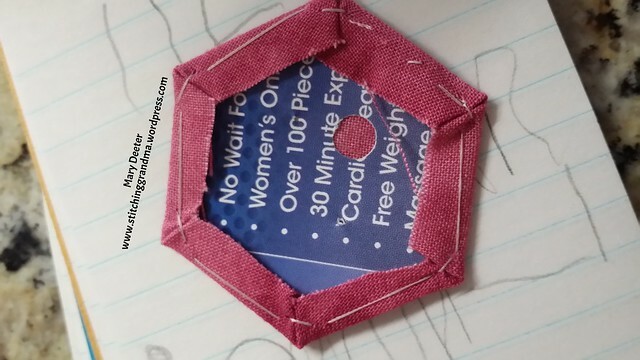 I worked on my “never ending hexi project” for an hour or two, out in the fresh air with a nice drink in hand. Over the course of the cruise, I met most mornings with the “Knitters and Knatters” and did a little hand stitching. I met a nice group of “stitchers”, and am glad that the ship offers the gathering every cruise. Monday rounded out with cocktails, dinner and a comedian, Steve Caouette, in the Princess Theater. 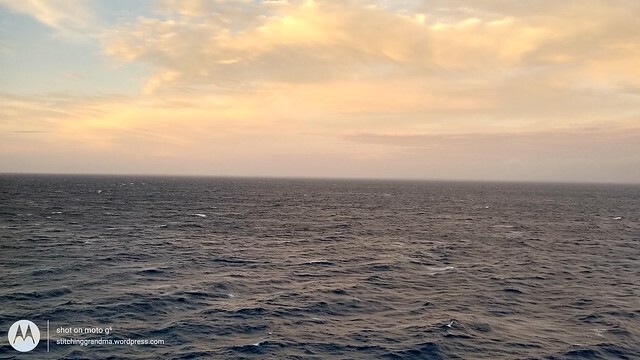 Tuesday was a scheduled sea day as we sailed towards Falmouth Jamaica. It was also the day for the Cruise Critic Meet & Greet, which I had coordinated before we sailed. I had my fingers crossed that everyone would “show up”. I was delighted to see the number of people who attended along with the ships officers. One member came with his fancy camera and took a group photo and some random snaps of people mingling with the officers. The weather on Tuesday was perfect for an afternoon spent by the pool. 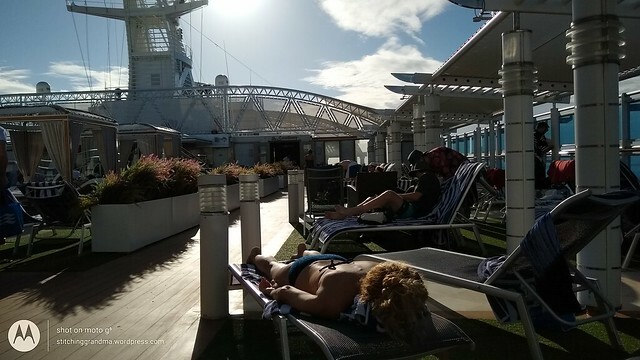 I enjoyed using the Adults only pool area on Deck 17, were there were loungers and shade. It was a beautiful place to spend a few hours, have a nap, read etc. As you can see, the weather improved dramatically. Blue skies, blue water, sunshine and warm temperatures are what make for a perfect day at sea! Oh, it has been almost a month since I have put up a blog post. Busy times! My big sister, Cathi, came to visit for a few days! We had some fun visiting with the youngest grandchild and her mother during her time here. Right after she departed, I hopped a plane (or 3) for a trip to Texas. I spent two wonderful weeks in Texas with the grandchildren and their parents and have had SO much fun! 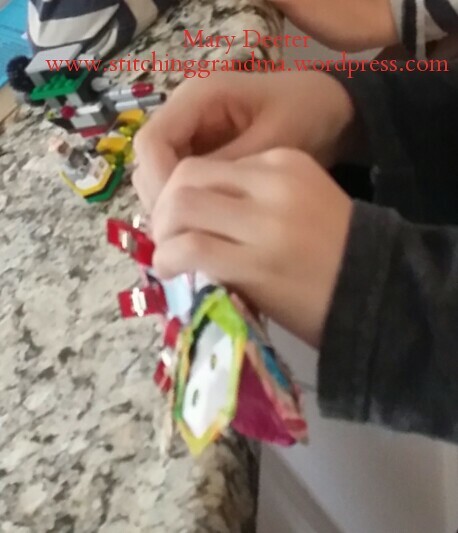 My 8 year old grandson was watching me as I was basting hexi’s , and wanted to do a “little sewing too”. 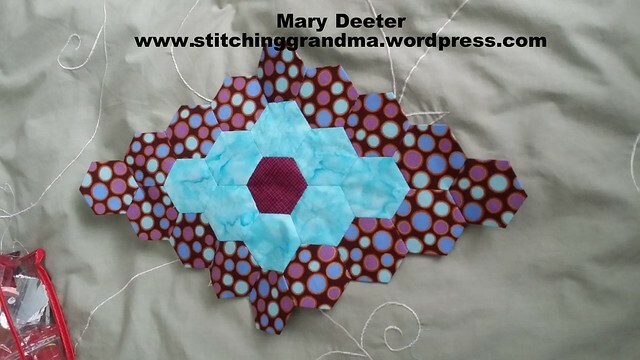 and then joined all the hexi’s together. check out his “whip stitches. I’d say he is doing a pretty good job for his first time out! He sure does have the concept down pat! He worked on that hexi flower for 2 solid hours and got it done! I asked him what he thought he wanted to do with it once it was all stitched together. He was uncertain, so I helped my self to a slightly worn kitchen towel from the drawer. It had a few worn spots that we “covered” with the flower. 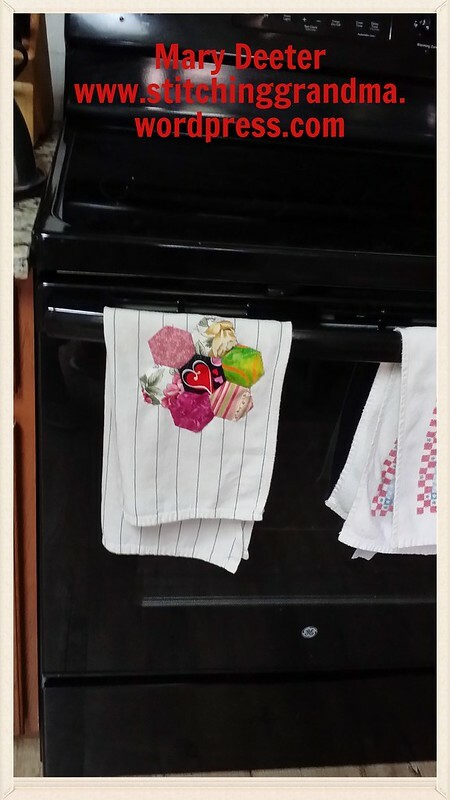 I helped with the “stitching down” to the hand towel , because his mom was due home “any minute” and he wanted to surprise her! 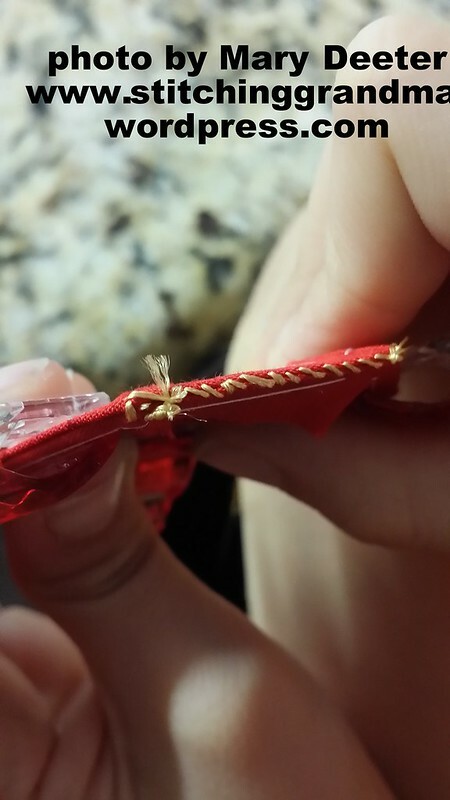 He told his mom that he made “something old new again“. She appreciates re-purposing things! I think he did a great job! Surprising what you can do with a few bits of fabric that some people might just throw away. 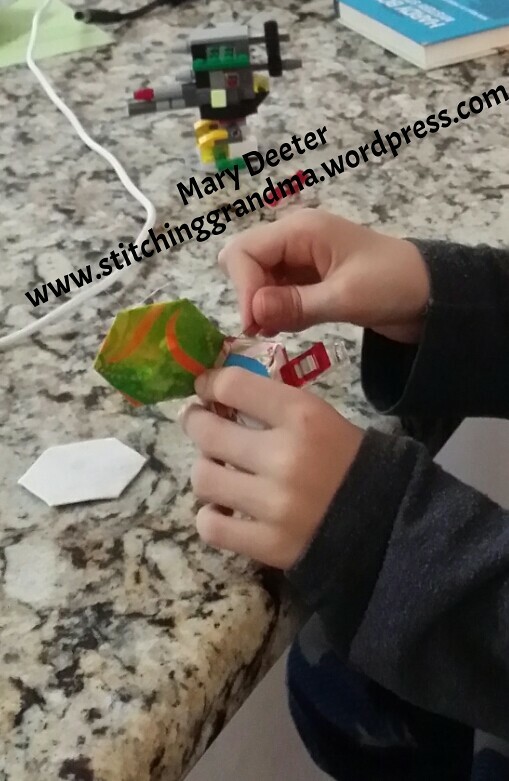 The youngest of the grands in Texas is 4, and she wanted to “sew” also. 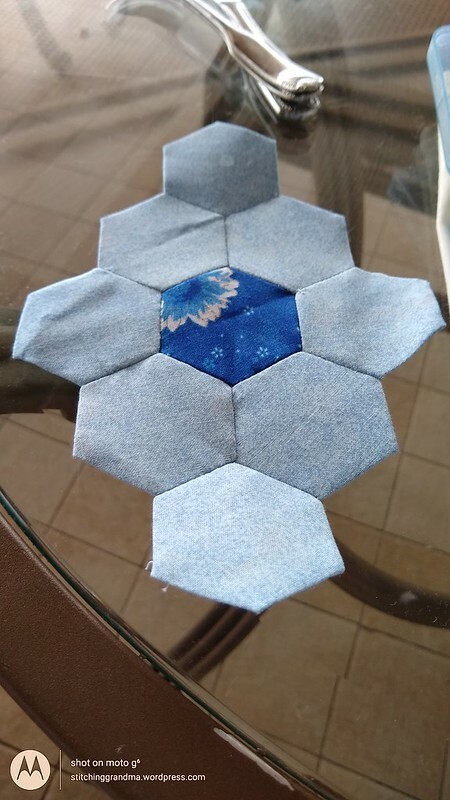 She picked out some hexi’s that I had already basted, and artfully arranged them into a flower. While visiting in San Antonio, I visited Las Colchas Quilt Shop. Worthy of a visit if you find yourself in downtown San Antonio. Small shop, but packed full of lovely items. I brought home a few fat quarters as a reminder of my trip. Of course, we did lots of eating of wonderful regional foods! Time spent in San Antonio is fun; and one place we visited downtown was called The Pearl. It is the best “urban renewal” effort I have seen in a long time. I put up a bunch of photo’s in an album on FLICKR – The Pearl . (https://www.flickr.com/photos/92296158@N02/albums/72157672440816744 ) It is an old brewery location and there must be 6 or 8 city blocks that have been redeveloped along the San Antonio River. Free parking and pecan trees were a bonus. We stopped in at La Gloria for chips, salsa and guacamole; and at Bakery Lorraine for a cookie. The pecan trees were all over the place and the grands loaded up a bag full of the wonderful nuts. They were quite the Urban scavengers! We enjoyed doing a little shopping and a nice walk along the river too. We poked into the lobby and bar of the Hotel Emma! What a great building. The remnants of the brewery were embraced in the wonderful lobby and bar area. If I had a million dollars and an opportunity, I would move into one of the new condo’s at The Pearl. I spent 2 solid days on my return home, working on the never ending stack of donated fabric for the Ocean Waves Quilt Guild Second Time Around table. Thank goodness for the 4 ladies that came on Monday and Tuesday to help me dig through and sort, measure, iron, fold and price some of the items. The rest of this week is dedicated to my time at Sit & Sew Camp, being held in a nearby church facility. 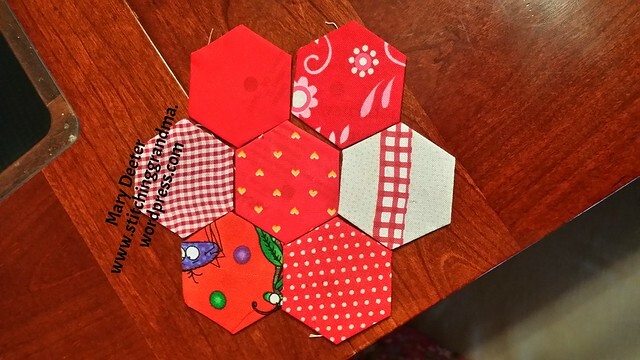 The members of several quilt bees, associated with Ocean Waves Quilt Guild are gathering to “sew together” on their own projects. We meet from 8:30 – 3:30 and visit, and sew, and laugh and catch up. So nice to spend the time with lovely women who are so talented. They will go along nicely with those Autumn leaves I have been working on! I spent my last 2 evenings gathering fabric and getting ready to go. 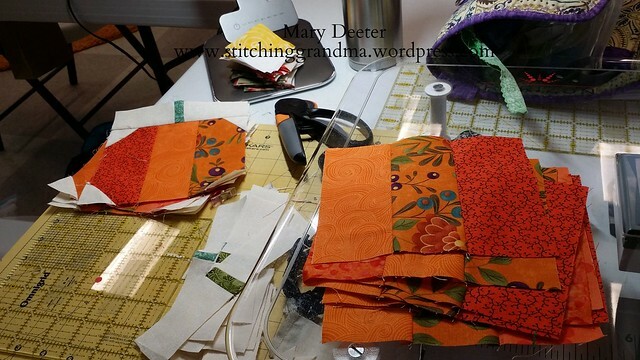 I made a kit of the fabrics for the pumpkins, plus I cut more squares for Autumn leaves. I am going to add a few greens, reds and a little more brown to the collection of leaves. So, more 2.5″ and 3″ squares. 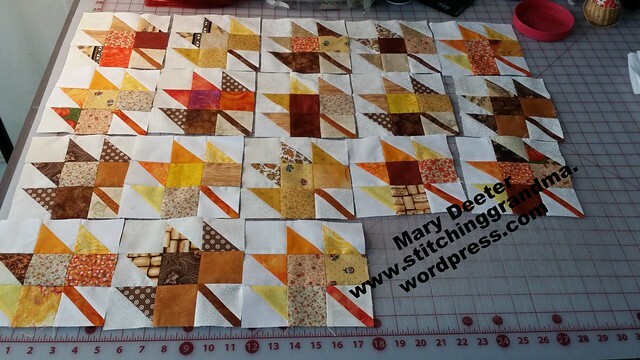 At the Sit & Sew this morning I stitched and trimmed up a stack of half square triangles, so I am ready for “leaf assembly ” tomorrow morning! Hope to have some “assembly” that looks like a table runner by the end of the fun on Thursday! 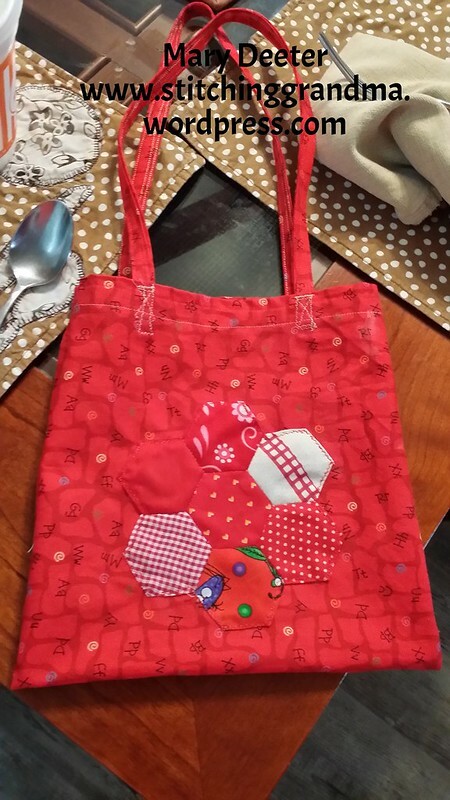 I’m sure I would be more productive at home, but it is great fun to gather together to sew.